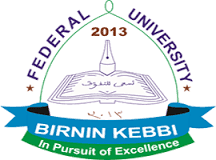 Federal University Birnin-Kebbi [FUBK] Advertisement for the Vacant Post of a Registrar and Recruitment / Application Submission Guidelines for January, 2019. The Federal University Birnin Kebbi (FUBK) hereby announces that the position of Registrar of the University will be vacant on 1st March, 2019. Interested and qualified individuals are invited to submit their applications for the position. The Registrar is a Principal Officer and the Chief Administrative Officer of the University. He or she is responsible to the Vice Chancellor for the day-to-day administration of the University. The Registrar is the Secretary to the Council, Convocation, Congregation and the Senate. Candidate for the post shall be visionary and have the ability to provide good leadership; He or she should possess personal integrity and be able to command the respect of staff of the University. i. possess a good honours degree not below Second Class Lower Division in Social and Management Sciences, Humanities and Education from recognized institutions of learning. Possession of relevant Postgraduate qualification is an added advantage. ii. be a registered member of any administrative professional body such as Association of Nigerian University Professional Administrators (ANUPA), Nigerian Institute of Management (NIM), etc. iv. have attained the rank of Deputy Registrar in a University and be computer literete. v. not be over 60 years of age by 1st March, 2019. It should be noted that retired public sevants are not eligible to apply for the position. The appointment is for a single term of 5 years and not subject to renewal. The salary and condition of service shall be as obtainable in the Nigerian Federal Universites. Nationality, State of Origin and LGA. Names and Addresses of 3 referees, one of whom must be Chief Executive Officer of your present organisation. Applicants are expected to request their referees to forward their reports under confidential cover directly to the Registrar, Federal University Birnin Kebbi not later than one week after the close of the advert. Applications should reach the Office of the Registrar, not later than six (6) weeks from the date of this publication.